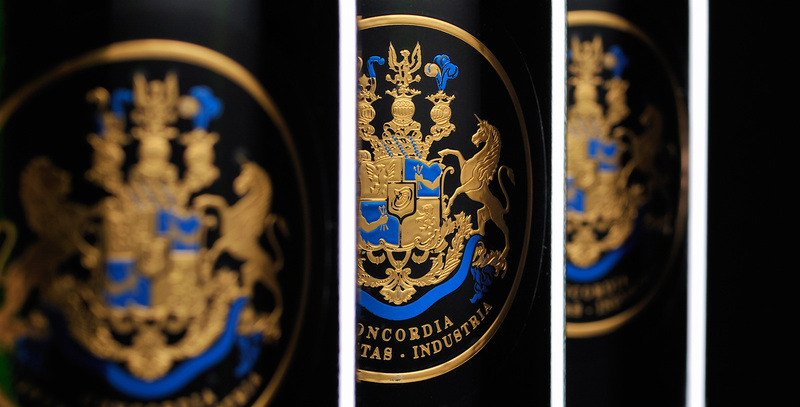 With over 150 years of experience in the winemaking industry, the Rothschild family are simply the most famous name in wine. Whilst not establishing a direct presence in Champagne until 2003, they have had an interest in the region since 1945, beginning with an investment in Champagne Ruinart. This was sold to LVMH in 1963, but the family returned in 1966, purchasing shares in Champagne Henriot, a partnership that lasted until 1988. The family’s love affair with Champagne was subsequently put on hold until 2003, when the three Rothschild cousins, Baron Benjamin, Baron Eric and Baroness Philippine came together with a single ambition: to combine the best terroirs with their know-how and finally add champagne to Rothschild’s heavy portfolio of wines. Thus, Champagne Barons de Rothschild was born. Impressive growth – the likes of which only a name like Rothschild can generate in such a short space of time – has seen industry veteran Frédéric Mairesse join as Managing Director and Jean-Philippe Moulin (previously at Champagne Ruinart) take over as Cellar Master. With a focus on Chardonnay grapes, the house have managed to secure contracts to an impressive 72 hectares of vineyard, with 50% located in Grand Cru rated Le Mesnil-sur-Oger and Premier Cru rated Vertus. In 2007, the House further cemented their long-term intentions with the establishment of a new winery, Chateau Rothschild. Still a relatively small operation (25-60 hL), all parcels are kept separate and the production of the highest quality Champagne is ensured by using only the ‘vin de cuvée’ (the first 80% and the purest juice produced from grape pressing), using a minimum 40% reserve wines in their non-vintage blends and using a low dosage in all cuvées. 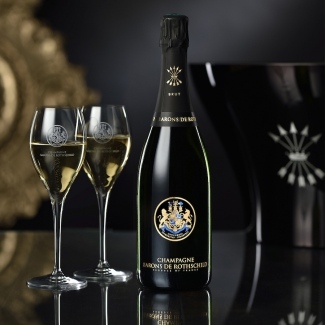 Barons de Rothschild began selling their Champagne in 2009, initially targeting the Japanese and German markets due to their recognition of the Rothschild name. After Japan, they next focused on Switzerland and Belgium as a result of Rothschild family connections and experienced great success in both markets. They now export to 70 countries worldwide and produce over 500,000 bottle annually – an astounding number for a company with only a decade of history. Their first vintage blend – Blanc de Blancs Vintage 2006 – was released in 2015 and last year they announced that two specially created cuvées will be produced exclusively for the Ritz-Carlton Hotel Group. Now firmly accepted as a serious name in Champagne, we met with Frédéric Mairesse during the London Wine Fair at Olympia to taste Champagne Barons de Rothschild’s full range. Frédéric began by reinforcing the ethos and focus of this contemporary Champagne House: high quality vineyard sourcing in the best regions of the Côte des Blancs. From the outset, Champagne Barons de Rothschild took a white grape exclusive approach to their winemaking – evident in the significant presence of Chardonnay in their blends. With the white grape accounting for just 28% of the total vineyards in Champagne, it is the rarest and most sought-after grape variety and nowadays accounts for an impressive 80% of BdR’s sourcing. Further, of the 312 villages in Champagne, just 17 are ranked Grand Cru and Barons de Rothschild own or source grapes from an impressive 15 of these growths – a fact they are loathe to let neither consumer nor trade markets forget. With such a Chardonnay dominant approach, it is hardly surprising that Blanc de Blancs is the flagship blend of the family-owned House. They currently produce four non-vintage Champagnes: Brut NV, Extra Brut NV, Rosé NV and Blanc de Blancs NV, and one vintage Champagne: their prestige cuvée, another Blanc de Blancs. Talking of the range, Frédéric was keen to highlight the brand’s prestige production focus. Whereas other producers significantly prioritise their House NV, at Barons de Rothschild their Brut NV constitutes 50% of total production, their prestige cuvée vintage represents 5%, with their other three non-vintage blends contributing a further 15% each. Whilst they have experienced unprecedented growth over the last decade, Frédéric believes they may have reached a plateau in production. Although they have produced twice the amount of their second vintage release (Blanc de Blancs 2008: 14,000 bottles), than they did of their first vintage release (Blanc de Blancs 2006: 7,000 bottles), total production is now nearing half a million bottles annually. Frédéric shared his concerns over the brand’s ability to increase this number further whilst maintaining the high quality of their champagne. After we tasted the range (notes below), talk turned to the future for Champagne Barons de Rothschild. An experimental winemaking team are currently investigating the use of oak, primarily with the ageing of their vintage blends and the liqueur de dosage. For their first vintage blend, Blanc de Blancs 2006, Jean-Philippe Moulin trialled the use of batonnage on small tanks for 9 months on the lees. A large focus for the House recently has been the introduction of a Brut Nature NV blend. Launched in Japan – BdR’s second biggest market behind France and the market that first requested a BdR Extra Brut – they experienced success with a few thousand bottles in Asia, but this victory wasn’t replicated on home soil in France. Perhaps most excitingly, in 2013 the House bought their first privately owned land from bankrupt producer Clos Pierre. Now named Clos Rothschild, Frédéric plans to make a single vineyard Blanc de Blancs of similar stature to Clos du Mesnil from this 0.5ha plot in Vertus. 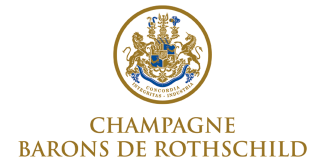 A hugely ambitious goal, but if anyone can accomplish it, de Rothschild can. Tasting the range, it’s easy to see why the brand has attracted such widespread attention with little trading history. Obviously the Rothschild name carries huge prestige and no doubt accounts for a percentage of the brand’s early success. 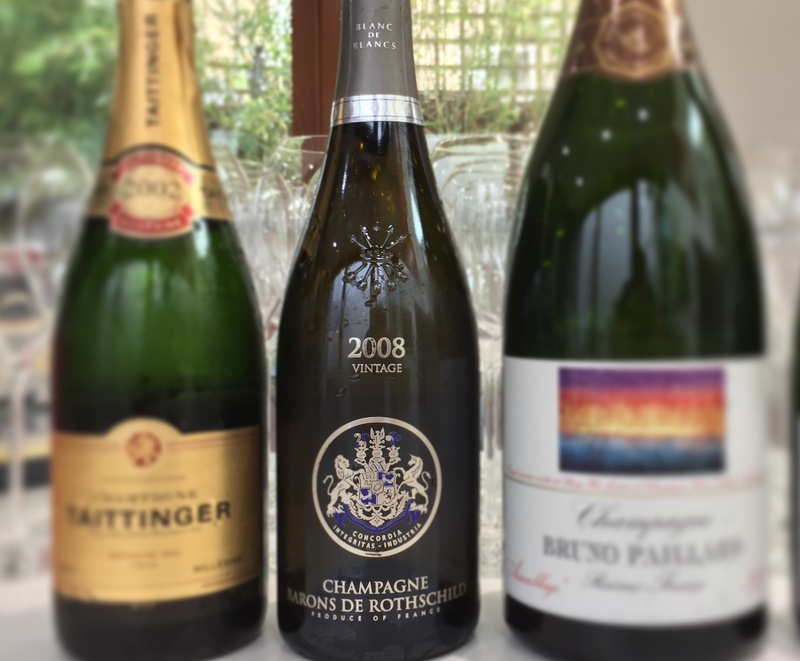 But the champagnes themselves hold their own against the very best – indeed the newly launched Barons de Rothschild Blanc de Blancs Vintage 2008 (not yet available, but we are assured will be very soon), ranked an impressive 6th in our recent blind tasting of 2008s. This is a Champagne House that has made incredible movement in just over a decade and with a name like Rothschild on the label, expect continued linear growth in both production volume and champagne quality. From 2010 base, with 2009 and 2008. Low dosage because of the older reserve wines. Lots of peach and apricot notes, with a hint of apple and quite a honeysuckle aromatic nose. Has very soft acidity. Went a bit dull after time in the glass. From 2009 base with 2008 and 2007. Just 3 g/l, again due to older reserve wine content. Strong yellow gold colour. Not so much aromatic strength but a lot of peach and apple notes. Has some honey which couldn’t be detected at first. Fresh apple character on the palate, good grip and a bitter finish. Seems okay, perhaps feel like it needs a bit more fruit. Dry peach and apricot on the end. Very fine bubbles. Nice creamy character, with clean and fresh apple flavour and a sherbet edge. Good richness of fruit and balanced acidity, very elegant but loads of complexity and doesn’t seem to have long lees character. Very pale, barely pink. Red fruit nose with cherries and pepper. Good freshness, but quite a tight and straightforward palate. Missing something, perhaps a higher dosage? (Now sold out). Lots of peach and apricot initially with honeyed notes developing. Quite aromatic flavours come through and the low dosage is obvious. Lots of apple freshness and hints of lees character. This has a real lightness. Not much complexity but it is very clean. Maybe a slight lack of concentration, perhaps the dosage seems too low for the fruit intensity? (Not yet released). Lots of apple and lemon aromas. Great mouth-feel and a refreshing acidity that seems to go on well. Bundles of peaches and apricot but lacking complexity. Quite dry.